Stick a fork in it, our budget-friendly kitchen makeover is done and it’s time for the big reveal! 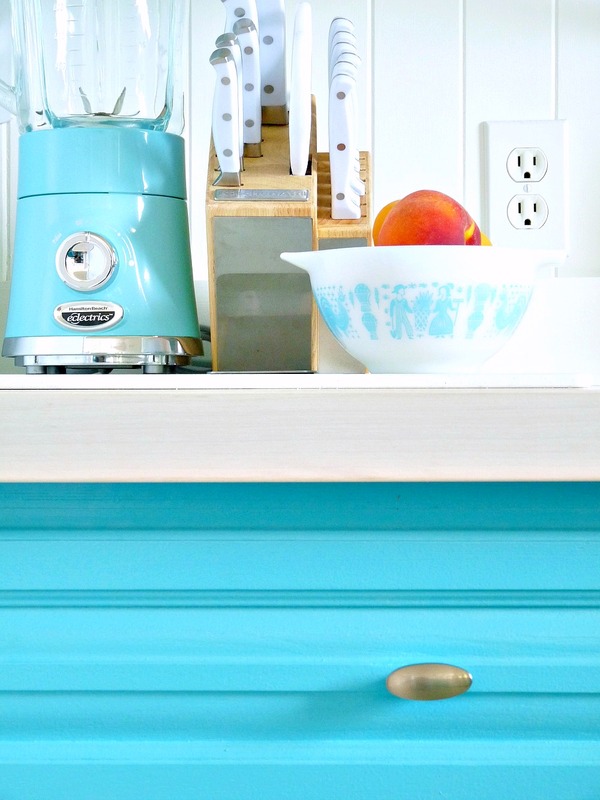 What better day to show off the turquoise kitchen I’ve been dreaming about since last summer (actually, since August 2012) than on my 30th birthday? I wish I had added “awesome turquoise kitchen” to my 30 before 30 list because a whole bunch of things didn’t get done while I was making magic happen in here. (Bear with me while I update this post with new, better, more true to life photos taken with my new DSLR camera…Since originally sharing this post, I’ve added some art and reorganized a bit – I’m never “done” with a space. 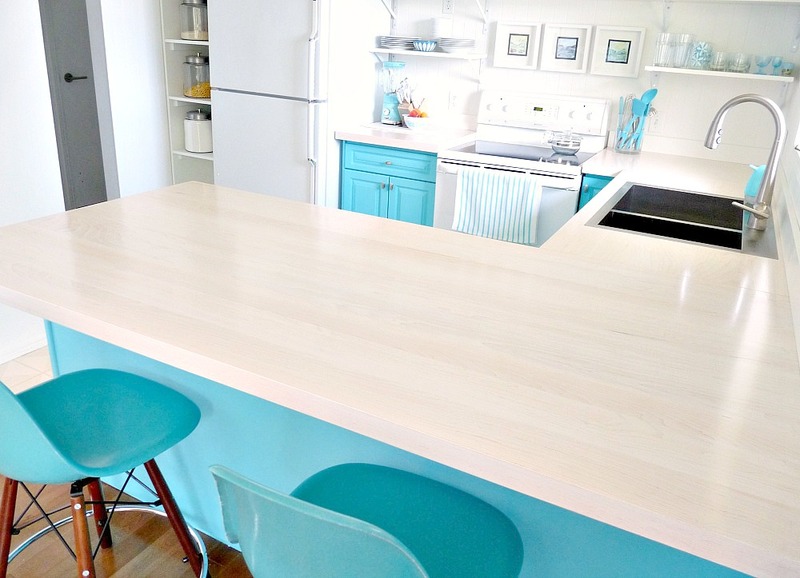 Here’s a sneak peek at how it looks today, but read on for more before and after photos, plus budget breakdown, of my dream turquoise kitchen). 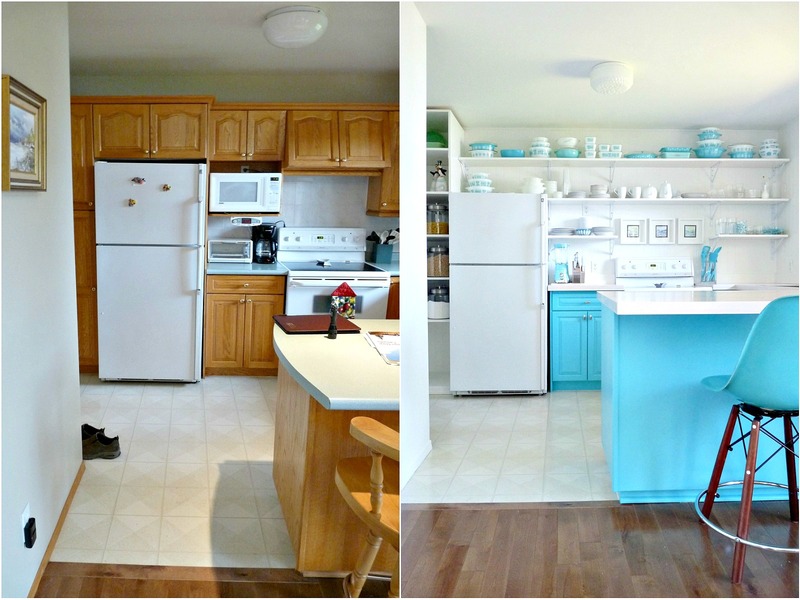 This affordable kitchen makeover, as smitten as I am with it, is temporary-ish. Down the road we’d like to gut the kitchen and do all new cabinetry, flooring, counters, tile – the works, but it might take us years to save up the cash so we decided it would be wise to spend a little bit now to make it look and function better for us while we squirrel away some dough and figure out what we want from the space. Here’s a summary of how we transformed this 1990s oak kitchen on a budget (with links to previous posts included throughout, and also listed at the end – along with our complete budget breakdown and sources). The upper cabinets were removed because they were so small and offered surprisingly little storage space. 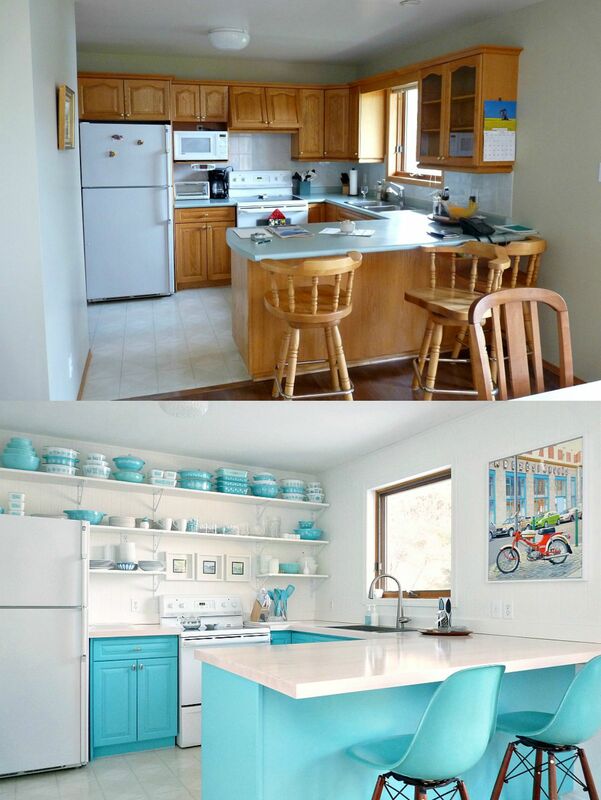 We primed and painted the remaining kitchen cabinets a turquoise that is nearly identical to my Pyrex butterprint collection. With the upper cabinets and tile gone, the walls needed a little TLC so we installed a few new pieces of drywall and used paneling for an insanely affordable backsplash. I painted the paneling a slightly creamier white than the rest of the house. I waffled about painting it the same as the rest of the space because it would make the paneling blend in even more, but I worried that the cream flooring and off-white stained counters would read really yellow against a bright white. To replace the awkward cabinets we ripped down, Hubby and I built a simple open pantry from plywood, which we primed and painted to match the walls (using a semi-gloss finish). Windsor Plywood sells laminated wood shelving which is the perfect width, so we grabbed four of those, which I primed and painted to match the walls and pantry (also in semi-gloss). laminated together (like our counters), they likely won’t cup or warp like a solid piece of wood could. which hold 500 lbs each. I think he’s telling me to go buy more Pyrex . . . ). A glass vase with turquoise KitchenAid utensils and a row of three of my framed enamel landscapes from Hungary offset the asymmetry. Kinda. It’s one thing that still bugs me a little, but I think I can live with it! less “out there,” and more built-in, for a similar feel to cabinetry. I added tons of handy storage with twelve 2 gallon glass Montana canisters for storing our dry goods. Happily, the DIY solid maple counters Hubby built still look amazing – as does the stainless steel sink and faucet we installed awhile ago. That’s the genius of working at a snail’s pace: by the time the reveal is ready, I’ve had a chance to put everything though the wringer. 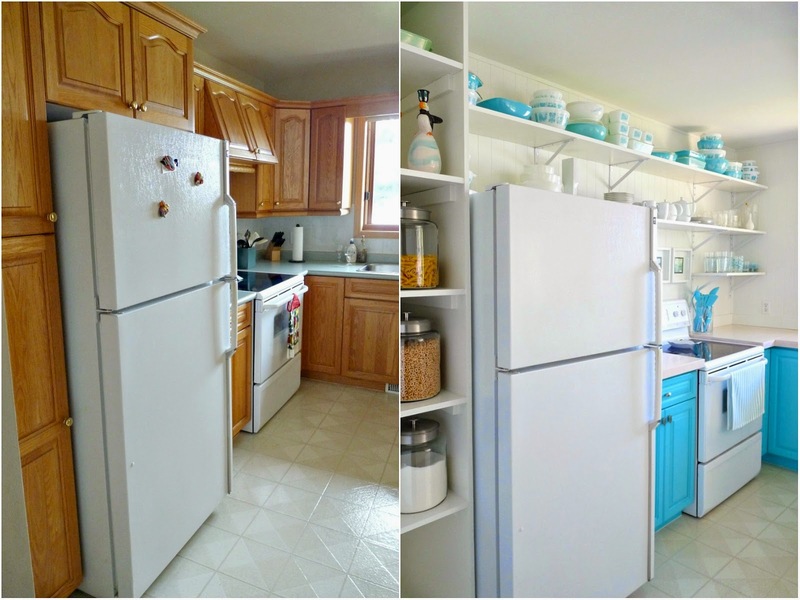 I love finally seeing everything finally come together in this kitchen makeover! I’ve been trying to be relaxed about the wood counters and just use them, but I do take certain precautions. After wiping them down or after an especially splashy dish-washing session, I wipe off any water with a dry tea towel. I used trivets for hot things and coasters for beverages – although rogue drinking glasses haven’t left any rings. I have this thing about the rubber feet on the bottom of the knife block and blender, though: I’m worried they will stain, so I bought a little cream-coloured cutting board to set them on. I stashed my orange kettle because I’m just really loving this icy palette of cream, white, and shades of turquoise. I’ve got some mint and blue in there for variety (and now some colorful new art). My Mom gave me her vintage glass Pyrex kettle, which doubles as a tea pot. I like that it doesn’t draw add to the busyness here. We stopped and started working on this kitchen so many times, and I lived without a functional space for so long, so it feels really, really good to have completed our budget-friendly kitchen makeover. It’s better than I could have ever imagined and I just wish you could see it in real life, where it is brighter, less grainy (! ), and more aqua (it looks denim blue in some pictures). The glassware sparkles and the wood counters gleam. over has immediately felt at home, which is such a great feeling! It’s perfect for our little lakeside home because it has a relaxed, happy, cottage feel. Grand total = $1492!! I’m pretty excited that we made such a significant change in this kitchen with less than 1500 bucks. I’d need to add a bit more if I had paid out of pocket for items like paint and our fancy faucet. Conversely, I think buying prefab wood counters from Ikea might be cheaper than our DIY walnut counters, but I’m totally in love with the decadently thick slabs of solid maple we’ve got going on – they make the kitchen. I’m not counting kitchen accessories, like my Pyrex collection, linens, glassware, etc., because most of these accessories I’ve collected over time. Hopefully our ancient appliances can hang on until the next kitchen reno! Oh, and if you see a math error (of I’ve forgotten something), please let me know. Thanks Emilie!! It feels bigger now than it did before – fresh, open, and airy is exactly what I was going for! what a difference! it looks awesome! i love your pyrex collection- so fun! Thanks Cassie! I've been itching to unpack my pyrex and display it on the open shelving since day one. Amazing! So daring of you but it totally works. Love seeing your collection on display too! Thanks Jane! I've always wanted a white kitchen but I just got this itch to do something different. Hi Tanya, this is so beautiful! You must both be delighted at how it turned out, it's stunning! I love the colours, but, you know, my favourite thing might be the way the sink is so perfectly placed in the countertop (I guess I've never seen one with that profile before, I really like it). And Happy Birthday! Thanks Patricia! The sink is hubby's favorite element too. I'm glad we didn't undermount it as planned because we would have hidden so much of it. Thank you 🙂 Cream walls – as opposed to bright white – is my equivalent of stepping out of my comfort zone, lol. 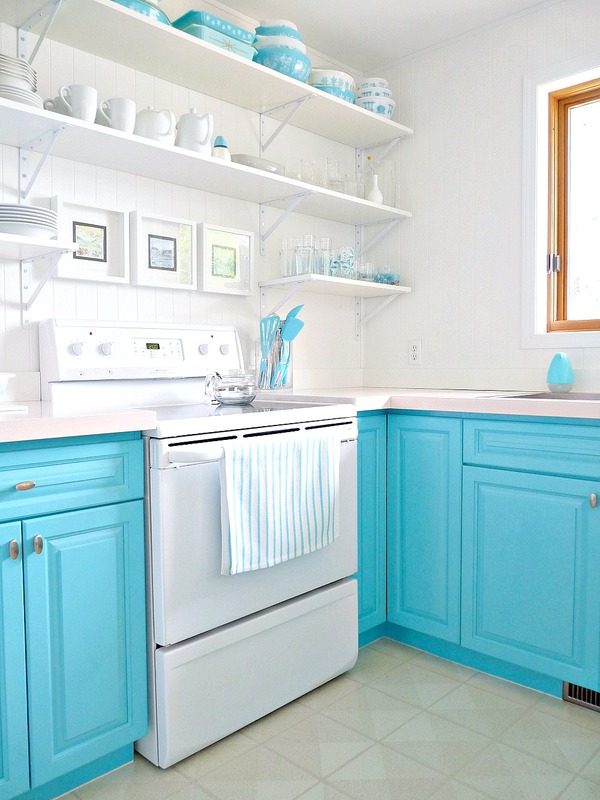 Turquoise cabinets? Never doubted them, but the slightly less white walls freaked me out!! Thanks for the vote of confidence, because I still give them the side eye some mornings. This looks amazing! I love all of the blue and white. I like the idea of a map in that empty wall space. Thank you 🙂 I'm so happy with how it turned out. I'm also happy to be done!! I love the counter and sink! So so so much better! Great job :)And Happy Birthday!! Thanks!! Yup, the counter and sink HAD to go – so glad we took the plunge and made counters. It was such a great experience and we both learned a lot about our respective diy roles! Beautiful! 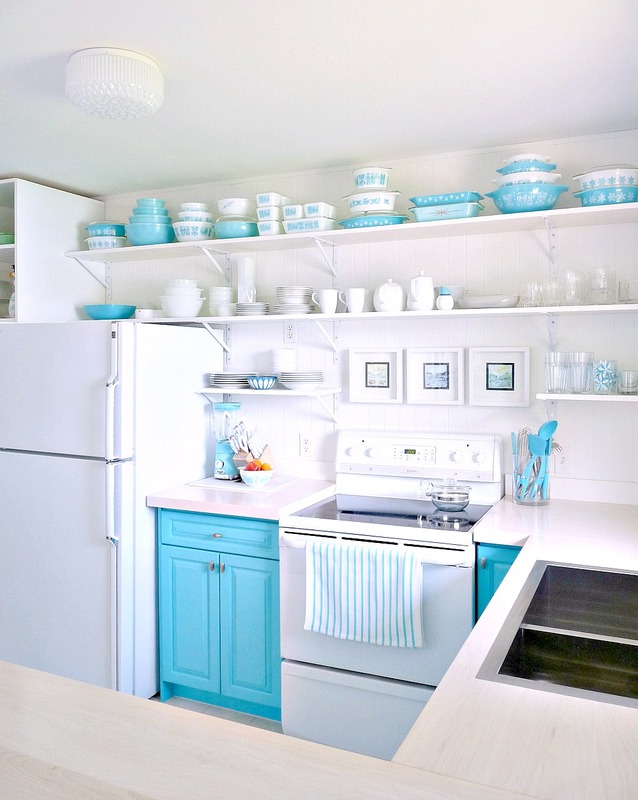 I am coveting your Pyrex collection- I LOVE the turquoise!! And I didn't really notice the asymmetry by the stove, until you pointed it out- you did a good job of tricking the eye. Happy Birthday! Thanks! I think this room will be the happiest room in the house when winter rolls around again. Instant mood-booster! Luckily I had the blender already – and the mass of Pyrex – but I splurged on the kitchen utensils. We have so much less drawer space here than in our previous kitchen and I figured having them out in the open would not only free up drawer space but also make them easier to use. I found them new, in package, on Ebay for a fraction of the price as in store (they're KitchenAid brand). I was really lucky that when they arrived that they were the right shade. Happy birthday & congratulations!! So gorgeous. I have so many colors of pyrex, it would be a disaster to put it on display LOL but yours is absolutely captivating! I love the splashes of greens thrown in. I, too, would be a bit paranoid about the counters 😛 but they were the perfect shoice for the space. Yay! I think that window needs curtains! Thoughts? Thank you :)I've seen some really beautiful, colourful Pyrex collections on display. I think the only thing is that the cabinetry, walls, etc., would be better done in a neutral. Ordinarily I would opt for curtains but we're doing curtainlessness (it's a word) on this whole side of the house because it has lake views. I think if just the kitchen had curtains but the dining room and living room right beside it (the space is open concept) didn't have them it might look odd. The wall looks SUPER empty to the right of the window but once I get some art hung up there I think it will fill it out nicely. Having said that, I have this really fun 1960s aqua print that I held up to see if I'd want them as curtains awhile ago. Swoon… So pretty. So maybe I'll change my mind and you'll see some curtains after all!! WOW! That top row of Pyrex is crazy! Looks amazing, Tanya! Congrats – your hard work has transformed this kitchen. The counters do look amazing and it is a much brighter space. You must sit on the stool just staring at everything. Happy birthday! Thanks! Yes, I do sit at the stools and admire the kitchen. It sounds so conceited, lol. It's just that the space has looked like a disaster since September, so in addition to loving how it transformed, I'm also marveling at the fact that it is finally done! Using it is such a joy too, because everything is organized and at hand. Your kitchen looks fabulous! What a great job. Thank you 🙂 It's making me really happy. You can see this room from so many parts of the house because the living areas are open concept – plus it's what you see when you walk in the front door or patio doors. It's nice to have such a focal point finally put together. 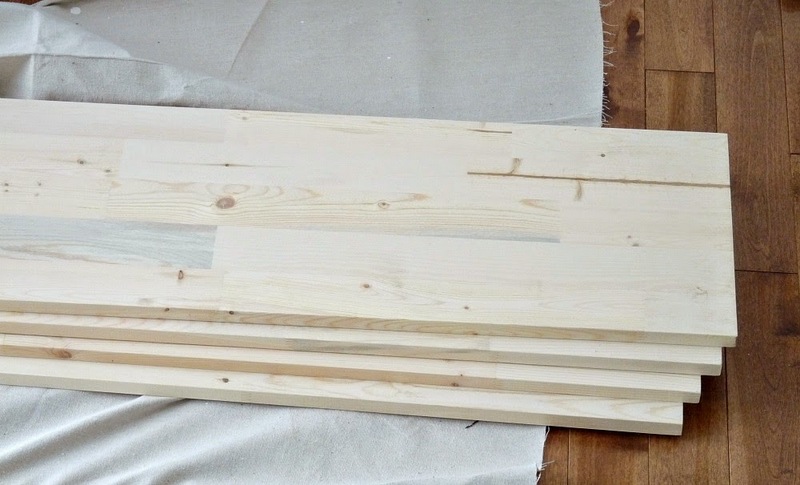 It's getting me excited to finally tackle some smaller projects – credenza top, curtains, some accessories for Szuka. I'm looking forward to doing a few projects that can be done in a weekend, not a season! 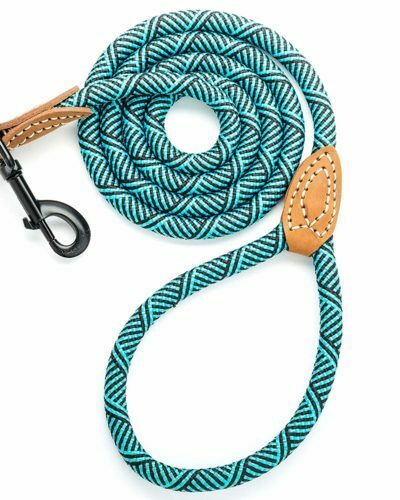 It looks so great and I LOVE your dedication to the turquoise. It's so beautiful and unique and yea, those chairs are fantastic. I had no idea Modernica even made stool versions of those. The shelves, the bottom cabs and the chairs are my favorite parts. Well done! Thanks Emily! When we moved to the lakehouse, I pictured a home with nothing but cool colours: blues, turquoise, and some greens. I've deviated a little bit, here and there, but for the kitchen I wanted to streamline the palette because I knew that with so much open shelving there was a risk of things appearing cluttered and messy if there were too many colours competing. Even though it's my favorite colour, it was a challenge to stick to it but the end result makes such an impact I'm glad I stuck to my vision. I seriously think your counters are my favourite part! They are too damn gorgeous. But your kitchen looks amazing. Love it. Would plunking a microwave down be all right if it were turquoise…? haha. I did notice the oven/ shelving thing not being all centred and I'd wondered why so I'm glad you wrote about that. I like your fix for it too 🙂 Can't wait to see more rooms finished, even if it is only a temporary quick fix. Thanks patty! I am surprised that the counters aren't hubby's favorite part after he labored so long on them… I'm still so amazed! 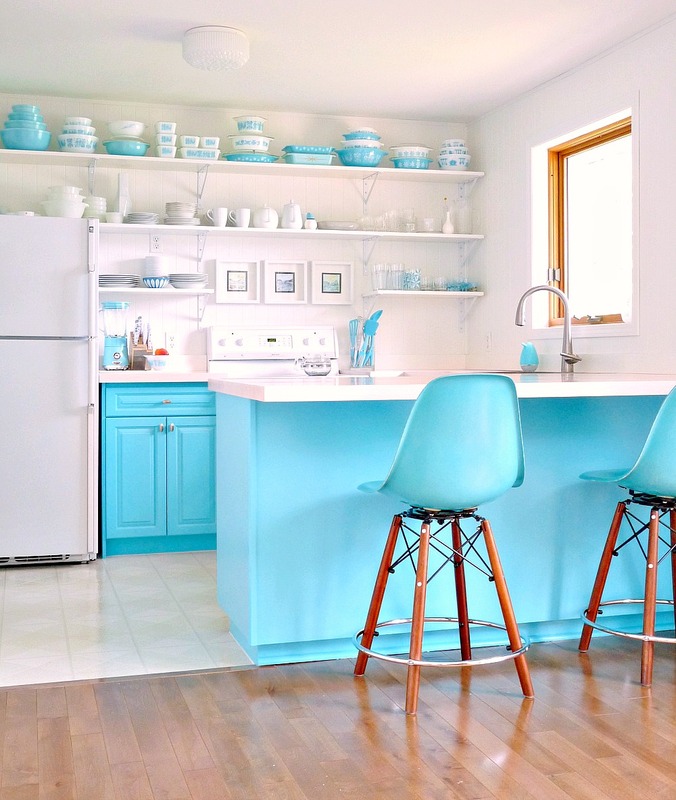 I painted our last microwave so turquoise is an option, haha. Hmmmmm :)With the shelves it was a no-win. Centred on the stove the brackets would have all been unequally spaced. With this arrangement there's an even space between two segments, but it's not centred. Brackets – the bane of my existence! I only see the Pyrex now anyway! The new kitchen is so much brighter! I love the shiny countertops and pyrex. These kind of makeovers always have a special place in my heart because they are by and for REAL people. Enjoy your new kitchen! Thanks Sarah! I'm so happy you said that because I like "real" makeovers too. When people spend a truckload of money, I just can't relate. Even when we do the real deal reno, I'm hoping to spend $10-15,000, not $50,000-100,000 like my favorite glossies. Even $10,000 makes me antsy but I know that to spend less I'll be getting inferior quality products and I'd really like phase II to last. Thanks Jazmyn! I am going to take you up on your offer because I'd like to really think through the next reno and use this time to figure out how I use the space, what's missing, what do I love. I think in phase II I'd like to widen the U a bit and maybe move the dishwasher. I'd like corner drawers instead of doors (saw that, loved it). I will noodle on it and hit you up for some ideas! Now I'm checking out the website to see you work your magic. I definitely think we have to move the dishwasher and stove to get drawers in there, which is one reason I'd like to widen the U also. I just HATE corner cupboards, but I'm open to other ideas which could make those books of the kitchen more functional. Wow! Such a GREAT transformation for so little money! 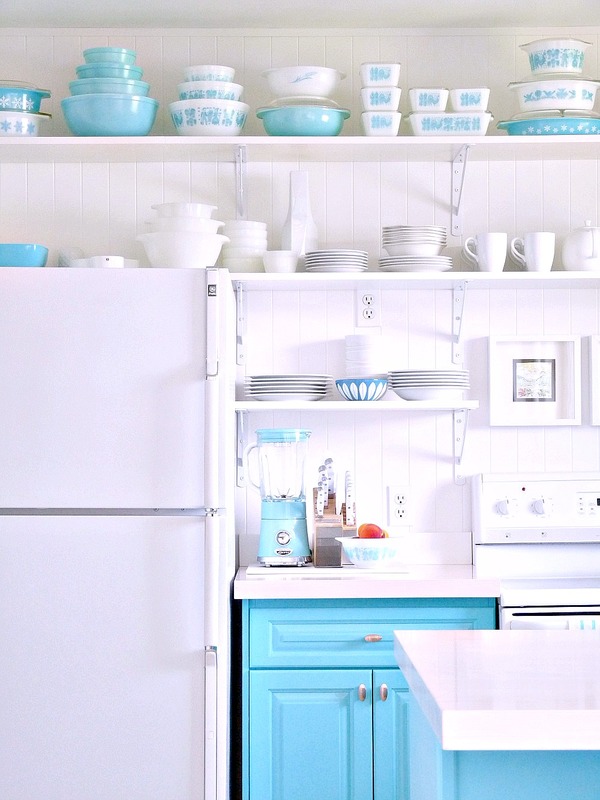 I ADORE your dishes that match your color theme…perfect. It all looks so very fresh and fun and (in your words) intentional. You are so wise to make those whimsical economic changes since you plan to change things out in a few years. Congrats on a great kitchen. Thanks for sharing all your tips. I saw your post over at "From My Front Porch to Yours". Thanks so much for stopping by! And for your kind words about my kitchen makeover. I'm happy it looks fresh and fun – I wanted fresh and fun! So impressed by this. Can't wait to see it in person. What a beautiful transformation…..I can't stop looking at all the pictures!!! You are one brave girl to go for all that deep aqua……so fresh and clean!!! Love the shelves and your collections, wonderful to see out in the open!!! Why would you want to change this in the future?? It is so perfect now! !I recently changed over to those same glass canisters from Target to hold all my dry goods, they seal so well. Job well done girl!!! Thank you!! I do love how it turned out but I think in five years I might want closed storage again (the dust!) and we'd also like to widen the U, move the dishwasher, re-do the floors. 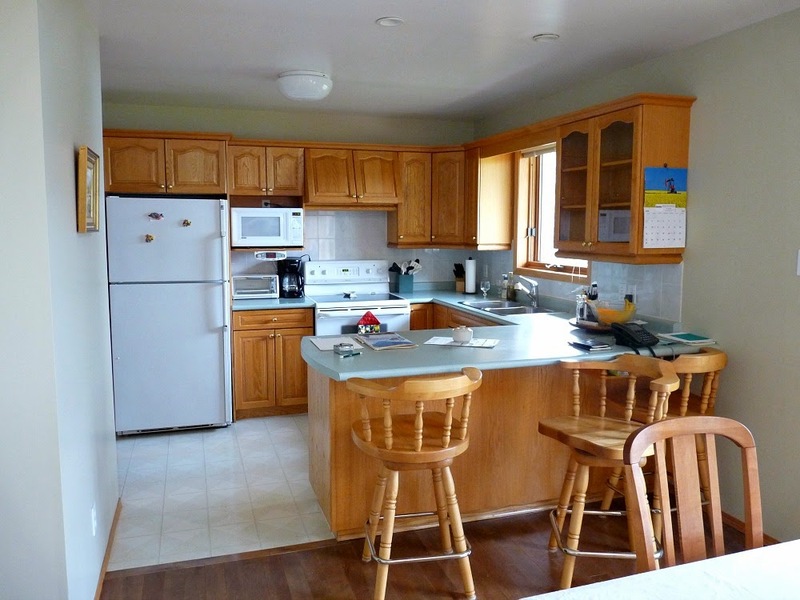 The cabinetry, although a fun colour now, is not in the best shape. The doors are okay, but the boxes have been treated a little roughly. It's awesome for now, though. So happy not to look at all that oak anymore. I've been dying for some free time to hop over here and tell you how amazing i think your kitchen is! A-Mazing! The pyrex collection is the perfect finishing touch! The kitchen is absolutely gorgeous! The white and the aqua are such an amazing pair! The Pyrex is such an amazing touch on those shelves. Looks amazing!! Absolutely adore your color scheme. I'd love to feature your post next week, but I don't see a link back to the blog party. Thanks Amanda! I'm pretty smitten with my kitchen too, and it's been so lovely to hear so many others are too. I have a link back to you blog, and the other blogs I linked up to, near the end of my post: after the budget breakdown and sources, but before the last bunch of photos. Hope that helps! Amazing transformation! I love the way you've incorporated the tableware/glassware in the overall look. Well done! Thank you!! 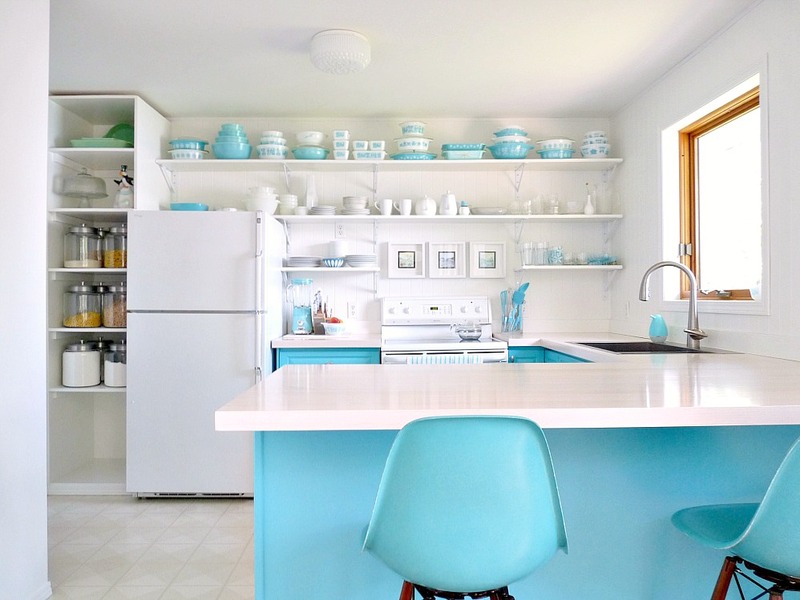 Oddly enough, the turquoise Pyrex was the inspiration for the kitchen. I'd always wanted to try brightly painted cabinetry and I love my Pyrex collection, so…here we go 🙂 It's definitely a happy space now and it felt so good to get my beloved collection out from behind closed doors. STUNNING! 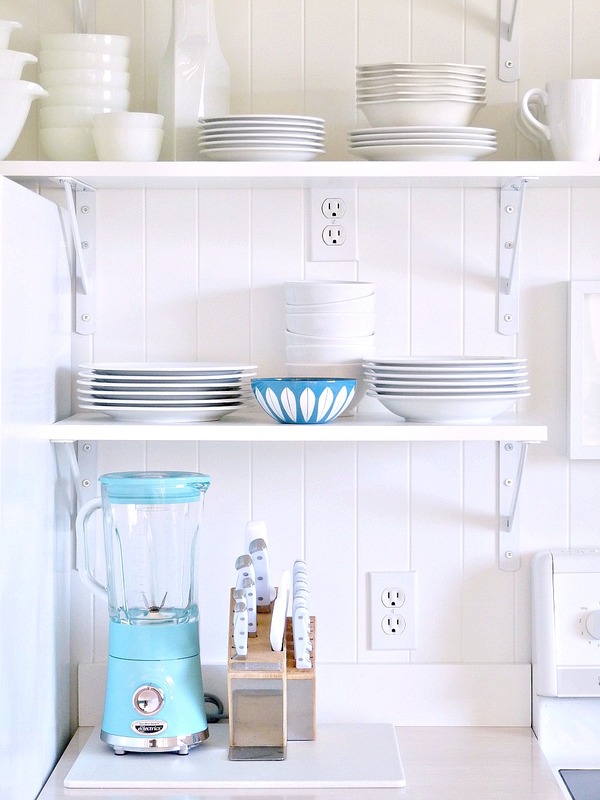 I love everything about your new kitchen…the color, the layout, the open shelves…beautiful…simply beautiful! Thank you so much!! It's so lovely to hear such nice things about the kitchen makeover because it was way more work than we anticipated, plus we tried some unusual things. So happy to hear you like it! This is unreal. I love the makeover, simply stunning. I am using this as a feature at next week's party. Thanks for linking to Inspire Me. Thank you so much for the feature. I'm so flattered because there were so many incredible projects and posts linked to your party! I will be sure to share the feature with my readers. Awesome! 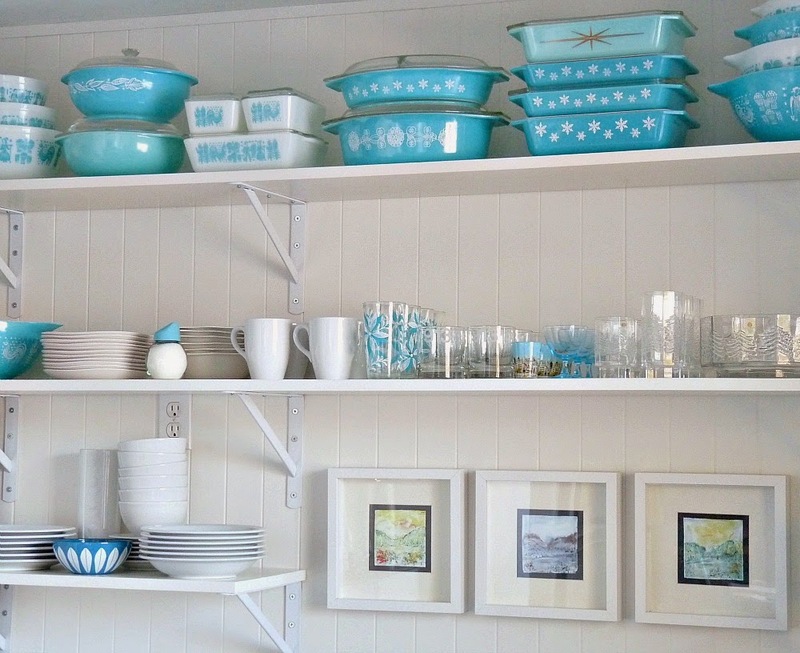 I adore turquoise and I am totalling crushing on the pyrex collection. Wow! We live in southern Ontario and Canadian Tire is one of my favourite places to shop. Thanks for sharing! A fellow Ontarian!! Canadian Tire definitely stepped up their game a few years ago and continue to offer such great home decor and organizing options. It's not the store I remember from twenty years ago. Beautiful! I love it! I wish I could do that with my kitchen! Husband would NEVER allow it! He is stuck in…somewhere where there is NO decor/design! 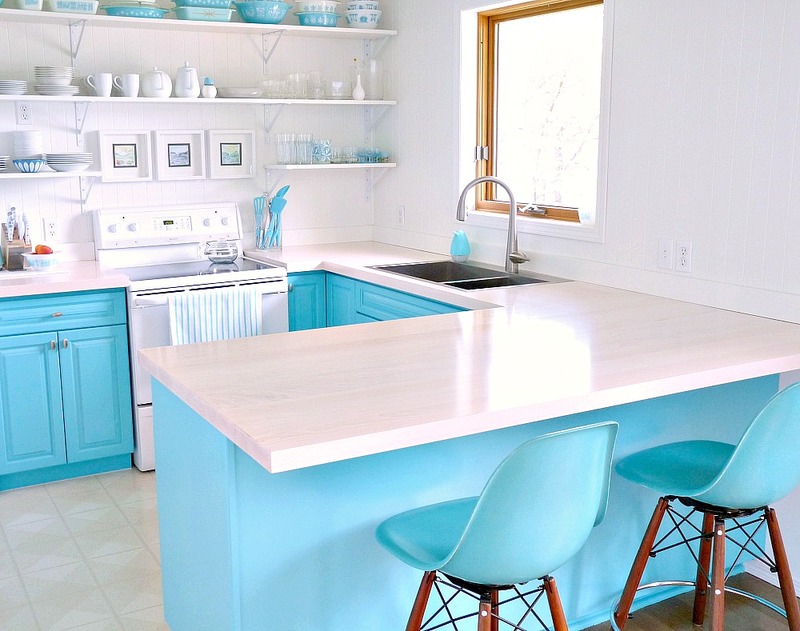 This wiould be so perfect for my kitchen and I would use turquoise blue! Wow…what a nice thought! found you on Wonderfully Creative Wednesday! Haha, my Hubby was so reluctant to paint the wood in our last home so I left it natural. He was also stuck somewhere with no decor. I told him it was my turn with this home to decide on cabinetry! Showing him photos helped him see the big picture. Now he is 100% smitten with the blue. This makeover is stunning! It is such a happy space! I am working on my kitchen right now too. It adds up quickly. I love your money saving ideas! 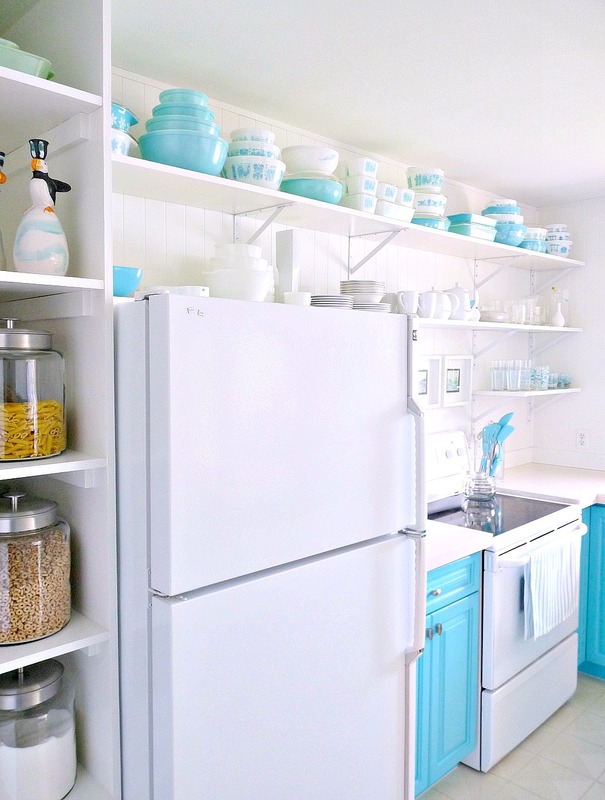 I absolutely head over heels with the cuteness of this kitchen. Well done and for under $1500. Thank you Carmody! I am so excited for the day when I can have a "real" budget. I'm already dreaming about the next reno. This looks amazing! Love the colour! I would love it if you joined and contribute your awesome posts at my link party at City of Creative Dreams, starts on Fridays 😀 Hope to see you there at City of Creative Dreams Link Party. Thanks for the invite! I will definitely come over and party with you on Friday. Thanks Suzan. I've been so eager to paint kitchen cabinetry – for years! – and this was my chance so I thought go big, or go home. I'm so happy with my bold choice. Thank you for the invite, I'd be happy to join! Thanks for linking up! Be sure to stop by again next week to link up another post. Amazing makeover! I may be a bit biased since it's my favorite color, but this is such a big improvement! You've married the modern and vintage decor very nicely. Thanks for sharing! Thank you so much! 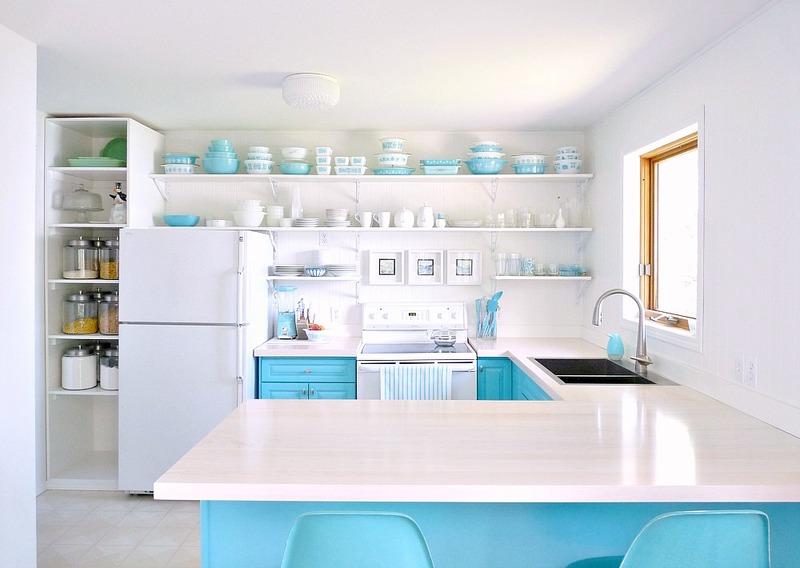 It's my favorite colour too so this kitchen is pretty high on my list of life achievements, lol. Thanks for coming over to take a peek and thanks for your kind comment! Thanks for letting me share my project with The Makers! The top of the pantry, what r your plans for keeping it from gathering dust? I use those long handled swiffer sweeper dealies. 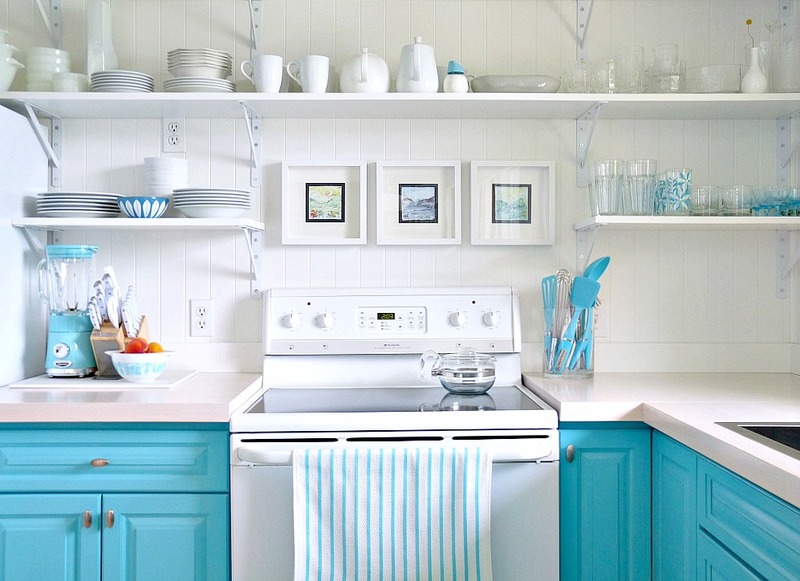 What a wonderfully fresh and pretty kitchen! Such a great color. 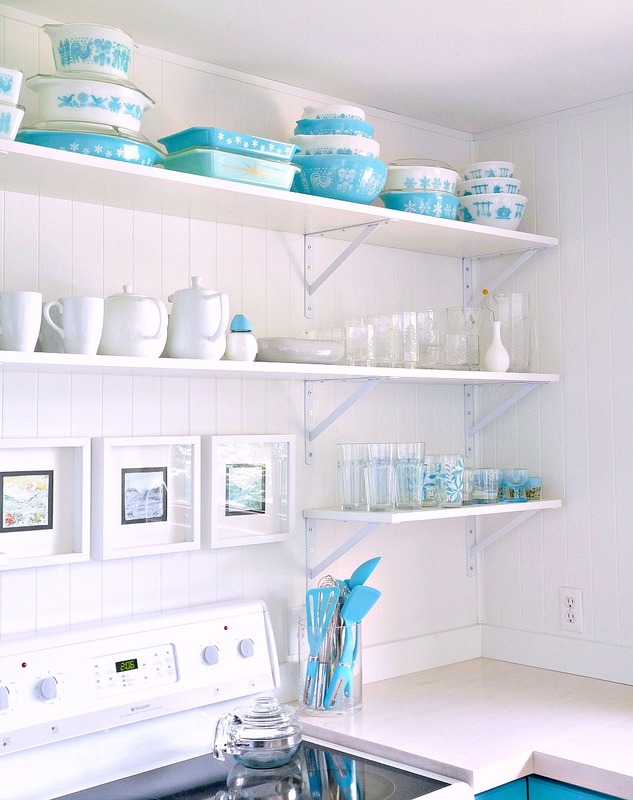 I love the open shelving and your pyrex collection is just the cherry on top! Thank you, Sharon!! I've been wanting to get my Pyrex collection out from behind closed doors for years. It's good for keeping my collecting it check, too, because I'm constantly reminded how much I have. Fun!! Thanks, Amy, I'm so flattered! I'll be sure to add the link to my press page. Thanks Katie!! I've always wanted to paint kitchen cabinets and this was my first (maybe last?) chance so I thought I should go big…I'm so smitten with the turquoise. What a fun makeover! I love how bright and fresh it feels. Bold choice with cabinet color, but it totally works! So happy to feature your beautiful kitchen at the party this morning! Thanks so much for sharing! 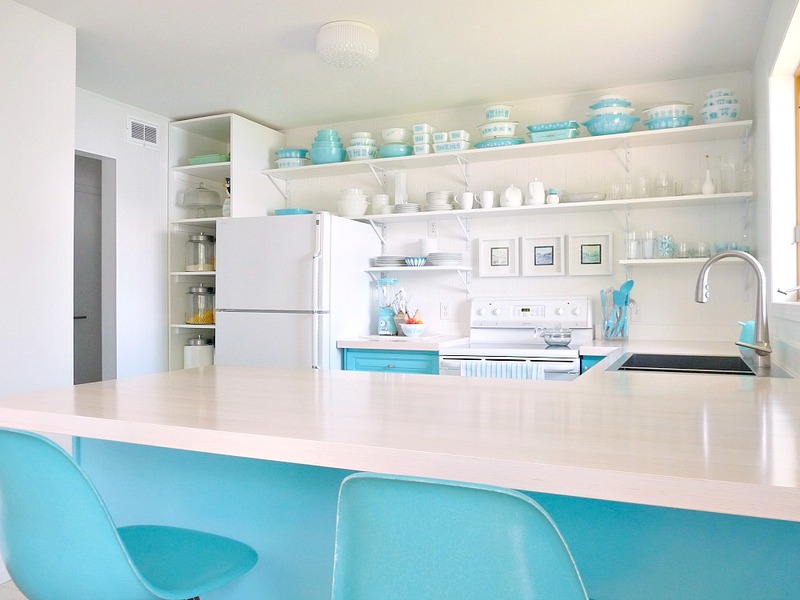 I think there should be a rule: lakehouse = some turquoise decor, lol. Thanks so much for featuring my kitchen!! I'm so flattered. 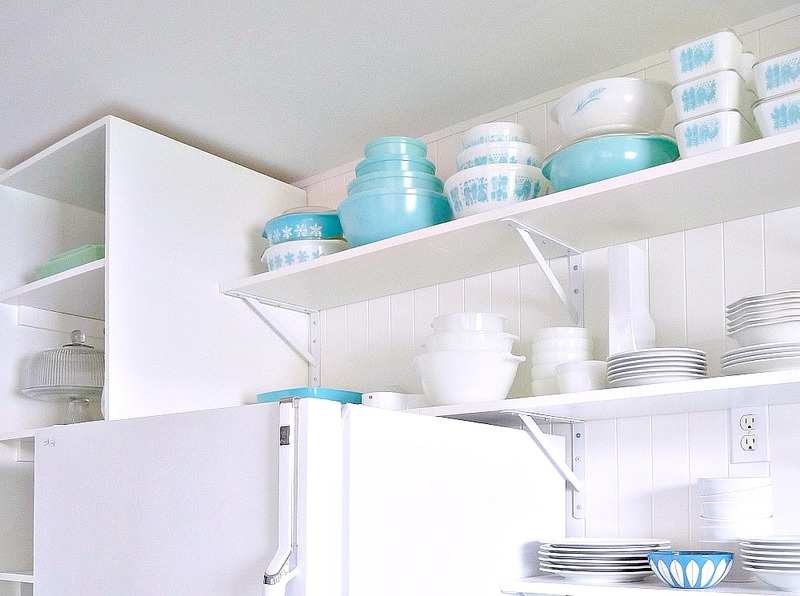 The turquoise butterprint look great displayed on your open shelving. Thank you!! I designed the whole room around my Pyrex collection which, as I type that, sounds incredibly obsessed. Love everything about this space! SWOON!! Thank you!! I'm so happy to see my plans finally realized – I'm swooning too. Thanks for hosting such a fun party!! I found a lot of great ideas from your other readers. This is SO COOL. I want this in my house. Thanks Katie!! I wish I could pack up a turquoise airstream trailer and drive from city to city making magic in other people's kitchens – wouldn't that be a dream job? 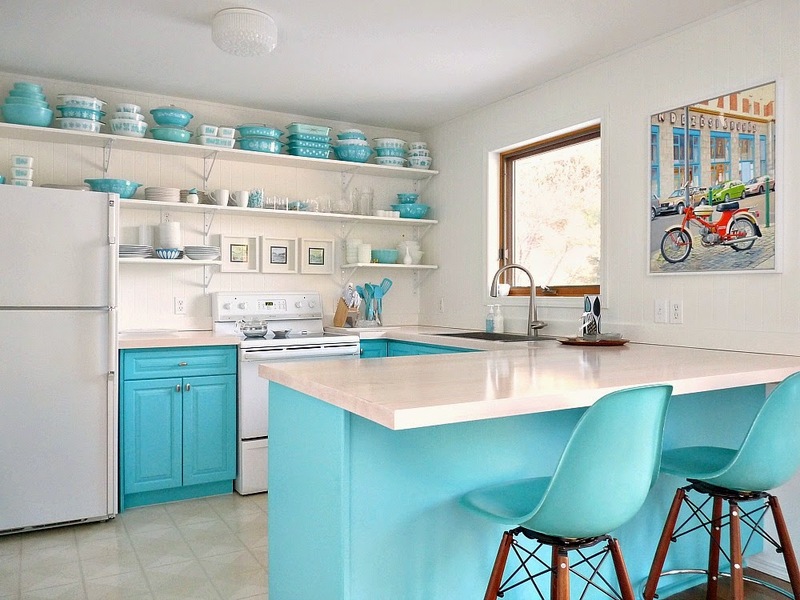 Except everyone's kitchens would look the same and there would be no turquoise paint left in the world. So lovely! I would have never thought that I would love such a bright color, but this is so gorgeous! Amazing! Thanks for sharing! Thanks Adria! I definitely went bold but I'd been itching to paint kitchen cabinets for years and I knew white just wouldn't make me fulfilled enough, lol. I might never have the chance again (Hubby LOVES wood but conveniently hated this kitchen's wood) so I didn't want to squander my only chance! Luckily, I love it. Love it! Can you tell me what you used to stack your nesting bowls to look like that? It's amazing! I have a fireking collection that I'd like to display like that! I use empty sour cream and yoghurt tubs which I trim to the right size. Yay! Finally got around to trying this and it works great! I like the take out containers from the deli as well! Awww, thanks Dora!! You're too kind. I'm just having fun with this space. wow! what a difference! It's so beautiful and light! I love the color you used! I am visiting from hometalk! Thank you so much!! I will definitely check out your blog. I have just added this to my ALL TIME favorite tours! In my imagination, I see this same kitchen in MY home, but with Crazy Daisy! THANK YOU for giving me permission to buy every last piece of CD I see! Thank you so much! A Crazy Daisy version would be AMAZING! Definitely scoop up every last piece you see – I'll even keep my eyes peeled! On the hunt for any particular piece? It's beautiful – so clean and bright. I love it. Also Known As: The Kitchen that is Not in Earthquake Country. 😉 I cannot even imagine having so much glass up on shelves. LOL. It's funny how our region can affect design choices. I love looking at all your pyrex tips. Do you have an entry on cabinet-painting? I've not been brave enough after living in two places that came with terribly painted cabinets that just didn't hold up.Thanks! Where is the picture of the scooter from? It's beautiful! Thanks! It's a painting by Artsheaven, they do reproductionso and custom oil paintings, which is based on a photo I took in Budapest Hungary. Thanks Jan! I have a fairly large four slice toaster that is stashed in the cupboard to the left of the stove. 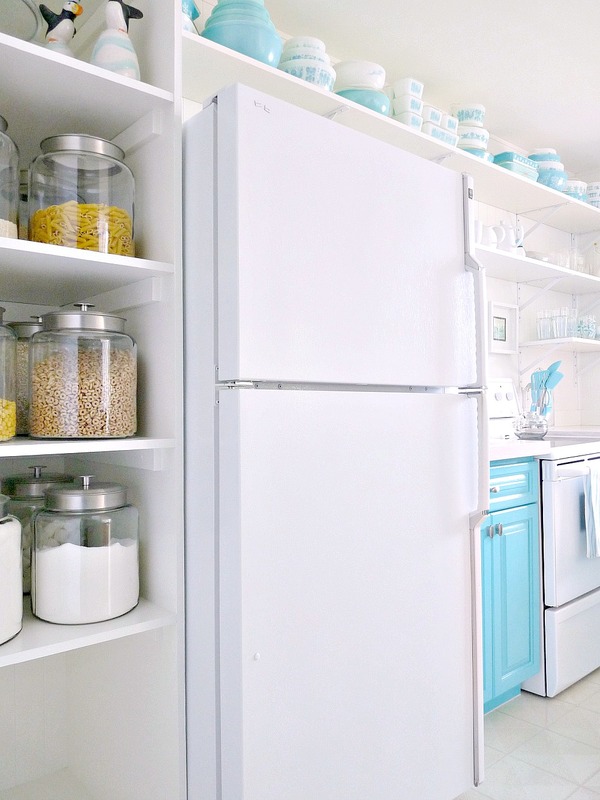 We actually had plans to put the microwave on the bottom shelf of the pantry, to the left of the fridge, but after living without it during the makeover process, we decided to forgo it – and we don't miss it! We ended up using that spot for our cooler which we use so often because we live so far from a grocery store. I like keeping it handy. Coffee isn't an issue for us because we don't have a coffee machine. I use a simple Melitta drip system with a ceramic pot and removable filter holder, which I keep in the credenza in the dining room. I'm a tea drinker, which is easy to store: a glass kettle on the stove (tea pot and kettle in one!). My tea selection, though, is huge and I stuff that in a corner cupboard in stackable tins. I always had a pretty clutter free kitchen counter, even when I had a bigger kitchen, so the transition wasn't difficult. My only wish, storage-wise, is for a bigger fridge or a deep freeze! My fridge is always packed but, alas, no room for anything larger. I've done a lot in the cupboard to maximize storage here, decanting things into identical tins and stacking pots and pans, etc. Maybe one day I'll have to do a post with storage tips, because I pack quite a bit into my little kitchen! 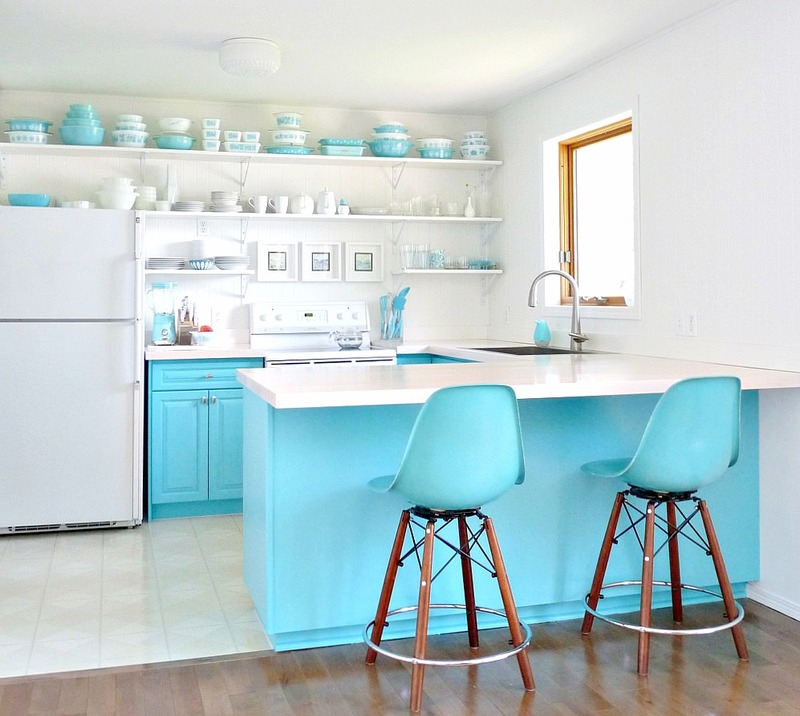 I came upon your kitchen on Pintrest, and I'm drooling with the turquoise colour! My favourite!!! An then all your turquoise pirex dishes, what a great collection. Love it all, you've done a great job! Hi Tanya – I am a Design Consultant in Toronto! So impressed by the makeover you did on your kitchen. Well done! Thank you so much! I'm sorry I didn't reply earlier. It's so nice to hear a professional approve of my makeover 🙂 It's such a fun space and it's really be helping me figure out what I do/don't want when we renovate for real. Love it, curious did y'all consider a farmhouse sink? I love a farmhouse sink but because we made our own wood counters, my Hubby insisted on a top mount sink and we found a great stainless steel one for a fabulous price at Costco. 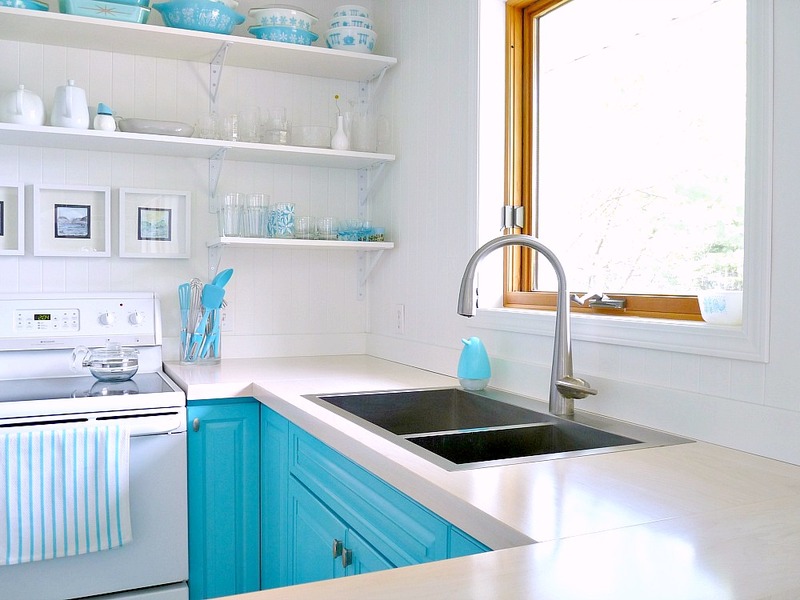 I have a kitchen pinned to Pinterest with white cabinets and an aqua farmhouse sink and I'm drooling over it! Looks great. Only thing I would change is the cheapo ikea light at top to a chandelier or something with more pizzazz! Thanks!! But the light stays. I loooove that light so much. Just discovered your site and I love it!and this kitchen is soooo Gorgeous! and It is so modern and clean looking. I’m really impressed. thanks for sharing with us. Hi Dawn! Your kitchen sounds magical – like such a happy space. It must feel like every day is a vacation! Where did you find the bar stools?? They’re from Modernica and I’m so happy with the quality!